In the second game of a Monday night double-header at Wilson, the No.3 seed Wyomissing Spartans battled No.6 seed Exeter. Right out of the gates, the Eagles offense exploded to take a 12-3 lead, led by Louie Arndt and Taylor Trojanowski. The Eagles would continue to dominate for the majority of the first quarter, holding a 20-7 lead after one. 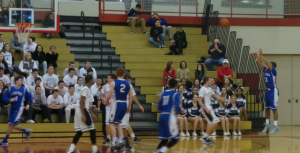 The second quarter saw much less offense from both squads, however, it would by Wyomissing who was held without a made basket during the frame. Being outscored 8-1 during the second, the Spartans headed into the locker room trailing 28-8. The second half saw the Eagles continue to dominate, scoring the first 11 points of the quarter, giving them a 39-8 lead. However, a Jarvay Bolton driving layup, followed by a long range Brock Kovach jumper cut the lead after three quarters to 39-13. The highlight of the game came in the early moments of the fourth quarter as Exeter sophomore Michal Menet threw down a big one-handed slam, sending shock-waves through the stands. Soon after the dunk, the entire Exeter and Wyomissing teams would be subbed for. The Eagles went on to a 47-23 victory. Leading the Eagles offensive attack was Taylor Trojanowski, who finished with 12 points. Michal Menet finished with 11 points and 10 rebounds. Daniel Garcia Jr would also add 10. The Spartans were led by Brock Kovach’s 8 points. The Eagles will square off with No.2 seed Berks Catholic on Wednesday evening at the Santander Arena. The Spartans, who laid claim to the No.17 seed in the District 3 AAA playoffs, will take on No.16 Northeastern on the road Friday night. Justin Allen is a 23 year old native of Pottstown, PA. Justin is a die hard Philadelphia sports fan. Justin has also written, recorded, and performed music for the last 10+ years.